As I said in my bloghop post I would be tagging two other authors in the blog hop thing. Doc has been working with computer technology for over twenty years. He started working with mainframe computer systems and has transitioned to client based systems using Windows based PCs, and then to platform independent web-based infrastructures. Through all this time, Doc has been the go-to guy when any of his co-workers have had problems because of his ability to discuss complex technological problems in simple, easy to understand language. In February 2010, Doc took his skills online and created The Nifty Tech Blog in an attempt to share his enthusiasm for technology with those who can best benefit with letting the technology do the work. Since that time he has discovered a love for writing and new media and has embarked upon a number of different projects. In July 2010, Doc turned from writing technology articles and started writing fiction as a contributing writer for the Every Photo Tells… podcast. 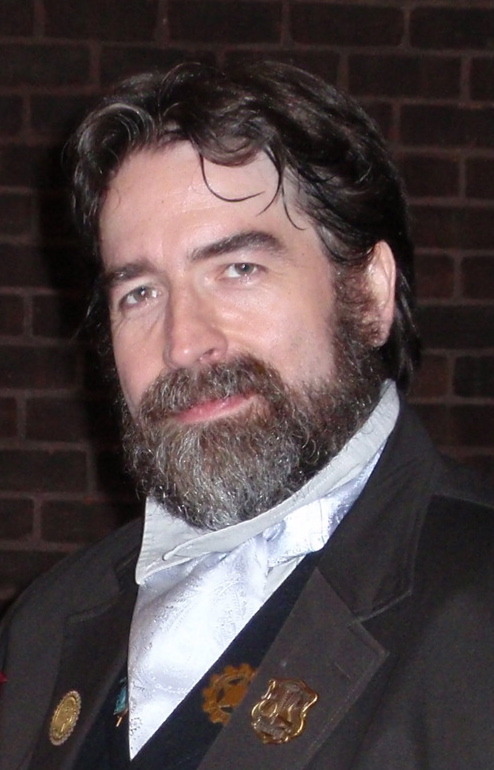 Three of his short stories were nominated for the 2011 Parsec Awards, but he was shut out of the Finalists list by fierce competition in the Best Speculative Fiction Story (Short Form) category. Doc continues to write short stories, and has also written an article on writing that appeared in the February 2011 issue of Flagship Magazine from Flying Island Press. Doc ventured into the podcasting world in the summer of 2010, going on microphone with Tee Morris in a six episode crossover series between The Nifty Tech Blog and Tee’s Bird House Rules podcast. Sadly, a dispute with Tee’s publisher has prevented the last episode of the crossover from going live. Doc returned to the world of podcasting as a guest on Flying Island Press’ podcast Galley Table in September 2010. The Galley Table crew invited Doc to come back any time. And he did. After several guest appearances, Doc was made a part of the Galley Table crew as the Galley Table Stowaway. Doc also started his own podcast in December of 2010 with The Shrinking Man Project, a journal of philosophy and personal change. He shares his experiences and observations in the hopes that others will be able to discover their own solutions to dealing with their weight by talking about their issues with others making the same journey. 1. You seem to be a very regimented person. I might be wrong about that, but how does that translate into your writing process? Where do you fall on the seat of your pants / outlining scale? 2. A lot of writers get the question, where does your inspiration come from, which is a pretty meaningless question if you ask me. But on the other side of the coin is the question what inspires you to write? For example, do you hear the stories in your head, and feel the need to get them out. 3. When do you find time to write, and when you are writing what does it look like? Do you have a certain time and place you have to be, are their any other requirements for when you are writing, quiet, music, special pen, pre-writing warm-ups? 4. Have you had a mentor in your writing process? And if so, how has he or she influenced your writing? If not, can you point to something in your life that has most influenced your writing, and can you share that with us? 5. You have written short stories and novels, you have done voice work and produced podcasts on your own. from all of that, what would you say was the greatest take away for your creative process? 6. Do you have any other things about your writing process that you would like to share with us? A family emergency has come up… and my blog post answering these questions is going to be late by a couple days.